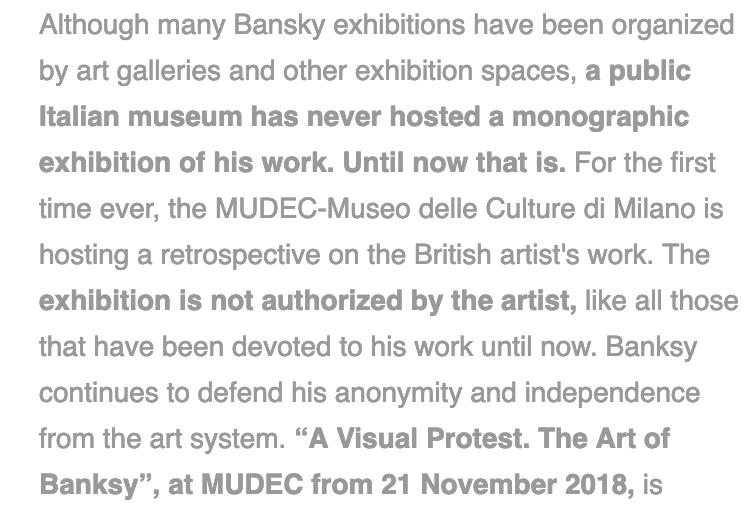 As thoroughly discussed by Enrico Bonadio on The Conversation, a few weeks ago the Milan Court of First Instance issued an interim ruling in favour of mysterious artist Banksy or, rather, the company that manages his IP rights (Pest Control Office). 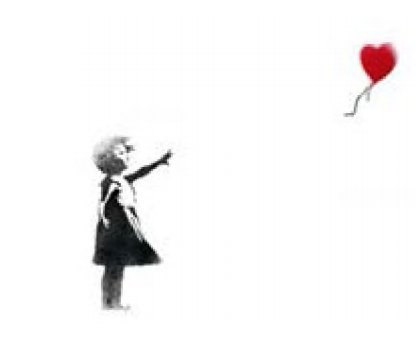 The application sought to repress the unauthorized use of Banksy's registered trade marks and reproductions of his/her artworks in the context of an art exhibition in Milan. The text of the decision in RG 52442/2018 Pest Control Office Limited v 24 Ore Cultura s.r.l. is available here. 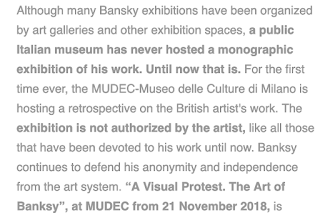 In summer 2018 Pest Control Office, upon being informed that a Banksy exhibition would be organized in Milan, refused permission to use the name "and likeness" [good luck with that] of the artist [yes, this is what the decision says], and threatened the exhibition organizers to rely on its trade mark registrations to prevent, inter alia, the making and selling of Banksy-related merchandising. Despite all this, Pest Control Office applied to the Milan Court of First Instance to obtain an injunction against the exhibition organizer, 24 Ore Cultura, as well as the withdrawal from commerce of all relevant merchandising. It claimed that 24 Ore Cultura had infringed its own trade mark rights and copyrights (the latter infringement would be also criminally relevant), as well as committing acts of unfair competition which would be also contrary to the rules on advertising as set out in the Code of Marketing Communication Self-Regulation Italy. The applicant had provided no proof that it would be able to enforce rights (if any) on behalf of the artist. 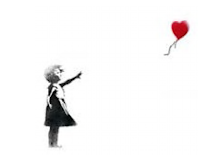 No copyright infringement could have occurred because [the translation from Italian is mine] "the activity of artist BANKSY would stand as a demonstration of the intention to renounce any copyrights on his/her works, in that such works are permanently located on display in public places". As such, displaying copies of these works and making and selling related merchandising would not be an infringement because these "would reproduce works of the artist that are in the public domain or have been assigned by relevant owners". As regards the publication of the exhibition catalogue, no copyright infringement would subsist also because of the availability of the Italian defence for quotation, criticism or review within Article 70 of the Italian Copyright Act. The trade mark registrations would be invalid because those signs were registered in bad faith: "said trade marks would have been applied for for reasons other than that of distinguishing products: indeed, PEST CONTROL OFFICE Ltd does not undertake any of the activities for which it has registered its trade marks (exhibitions, editorial products, merchandising), but rather uses those registration to prevent third-party lawful activities". The degree of protection enjoyed by the third-party sign and the sign for which registration was sought. In the context of such communication - which in itself is not unrelated to the the power of attraction of a trade mark, its function to guarantee quality, as specified in the categories 'communication', 'investment, and 'advertising' (as per the indications of the Court of Justice [in] Interflora) - it is not even possible to detect any parasitism [...], derogatory or in any case prejudicial behaviour that would damage the applicant, also taking into account that the marketing communication realized by [the respondent] expressly indicates the lack of any authorization from the artist and, therefore, the lack of any connection between this and his/her successors in title and such organization." Referring to the CJEU Gillette decision, the judge concluded that the behaviour of the respondent was not contrary to the principles of professional fairness. A different conclusion was however reached as regards the respondent's merchandising. 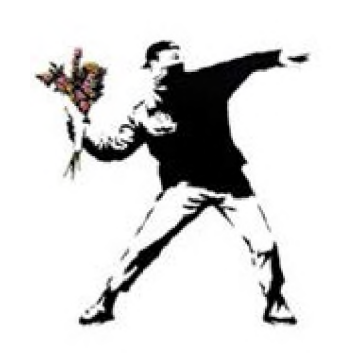 The use of the name 'BANKSY' in connection to merchandising "without any specific relation to the exhibition" made it apparent how the intention would be purely commercial and such as to conflict with the scope of the trade mark registrations, which also cover goods in Class 16. Hence, infringement was likely to subsist. [T]he exhibition in progress in Milan consists of copies of works by the artist acquired by private parties and which have been commercialized with the authorization of the artist himself/herself: this means, as a matter of fact, that the peculiar issues of copyright in street art are not relevant to the present case [...] In this context, what applies is Article 109 [of the Italian Copyright Act], which provides that the transfer of a copy of a work does not imply, save for any agreement to the contrary, the transfer of any economic rights vesting in the [underlying] work. The abridgement, quotation or reproduction of fragments or parts of a work and their communication to the public are allowed insofar as they are made for the purpose of criticism or discussion, within the limits justified for such purposes, and do not conflict with the commercial exploitation of the work; if undertaken for teaching or research purposes, the use shall only occur for illustrative purposes and not for commercial purposes. In all this, however, the judge found that he did not have sufficient elements to determine whether the applicant was the holder of the relevant economic rights, or whether - instead - the artist had reserved them to him/herself. With regard to the unfair competition claim, the judge rejected it in that for unfair competition to be established what is required is the ascertainment that the behaviour objected to is objectively contrary to the principles of professional fairness and is also likely to cause damage to the subject that advances such claim. In the present case it was not clear whether Banksy had transferred his/her right of reproduction to Pest Control Office: as such, the applicant could not demonstrate that the unauthorized reproduction of Banksy's images by the respondent would be likely to cause damage. The judge granted the injunction as requested by the applicant in relation to the merchandising. 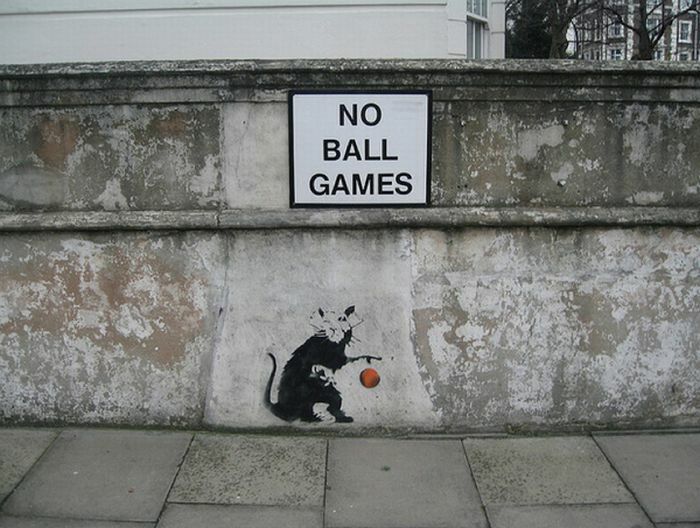 However, at least at this stage, he was not able to accept the claims based on copyright and unfair competition, due to the fact that the applicant had not demonstrated unequivocally that it would be entitled to enforce Banksy's economic rights. In any event, he found that the behaviour of the respondent would substantially amount to copyright infringement. This interim decision raises a number of important questions, which would be interesting to see developed further in a full judgment on the merits. As far as trade mark law is concerned, this cases raises the issue of bad faith registrations and, if one wishes, also broader reflections relating to overlapping IP rights. 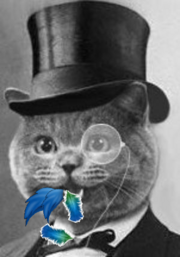 Readers might remember that not long time ago the EFTA Court ruled against trade mark registration of public domain artworks [Katposts here and here]. 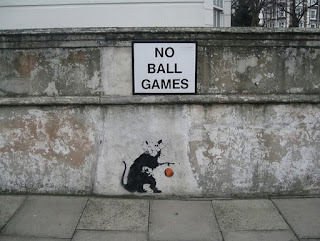 While in the case of Banksy the issue is not, of course, one of public domain [though the respondent in the Milan proceedings questioned the copyright status of street art], it is important to recall how the EFTA Court also noted how a trade mark based entirely on copyright-protected work presents “a certain risk of monopolisation of the sign for a specific purpose, as it grants the mark’s proprietor such exclusivity and permanence of exploitation" [para 70]. The Italian defence for quotation, criticism, or review: an out-of-sync interpretation? Turning to copyright, the decision highlights once again the importance of identifying what the work actually being reproduced is: in this case it was not the actual graffitis, so the issue of street art protection was not relevant. 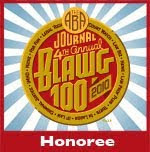 In addition, the decision also calls for caution when considering the availability of potential copyright exceptions. In this case, it is true that Italian law has a quotation, criticism, or review defence; however, its application does not appear to encompass reproductions of works in their entirety. This said, a more modern interpretation of this provision might be not to exclude a priori the reproduction of a work in its entirety, eg, a photograph, from the scope of the exception. This approach would have the merit of being more in synch with what is required under the Berne Convention and the InfoSoc Directive. Article 10 of the Berne Convention appears to mandate the recognition of a quotation 'right' by stating that it shall be permissible to make quotations from a work, as long as the work in question has been lawfully made available to the public, and provided that the making of quotations is compatible with fair practice, and their extent does not exceed that justified by the purpose. Use of the modal verb "shall" would arguably impose on members of the Berne Union (which include Italy) an obligation to acknowledge a right of quotation, which is not necessarily limited to parts or fragments of works. In addition, in its relatively recent (2011) decision in Painer, the CJEU held that the quotation exception within the InfoSoc Directive in principle encompasses photographs. In light of international and EU law provisions, as well as the principle of non-discrimination, more recent Italian scholarship has indeed held the view that Article 70 of the Italian Copyright Act should not be read as excluding at the outset reproductions of works in their entirety. This was, however, not the view adopted in this recent Milan decision. esclusiva regolate dall’art. 70 l.a.
pubblicazioni comunque illustranti in generale la sua attività artistica.